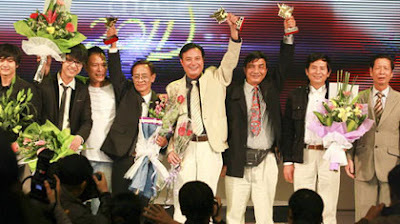 The Hội Điện ảnh Việt Nam (Vietnam Cinema Association) held the 10th Annual Cánh diều vàng (Golden Kite Awards) on Saturday night at the Friendship Palace in Hanoi. Hữu Mười's Mùi cỏ cháy (The Scent of Burnt Grass) led the winners with four awards. The film about students who left school to fight American forces in 1972 won Best Feature Film as well as Best Screenwriting for poet Hoàng Nhuận Cầm, Best Cinematography and Best Music. Additionally, the movie received a Certificate of Merit from the General Department of Politics for being the best movie about war and revolutionary ideals. Charlie Nguyễn's Long ruồi (The Big Boss) picked up three awards including Best Director. It also won acting awards for Actor Thái Hòa and Supporting Actress Tina Tình. Best Actress went to Quỳnh Hoa for the hip hop film Sài gòn Yo (Saigon Electric). Hiếu Hiền won Best Supporting Actor for Hotboy nổi loạn và câu chuyện về thằng Cười, cô gái điếm và con vịt (Lost in Paradise). The title literally translates as "Rebellious Hot Boy and the Story of Cười, the Prostitute and the Duck" and is sometimes shortened to Hot boy nổi loạn. Two directors, People’s Artists Bùi Đình Hạc and Đặng Nhật Minh, were honoured for their immense contributions to the development of Vietnam's national cinema. This year’s Cánh diều vàng received 137 entries, including 12 feature films, 19 TV series, 37 short films, 41 documentaries, 11 cartoons, and ten scientific films.